The temporary exhibition "Chrismukkah. Stories of Christmas and Hanukkah" was on show at the Jewish Museum Berlin from October 2005 to January 2006. The exhibition has long been dismantled but the interest in the theme remains considerable, which is why we have decided to continue to make the key content of the exhibition available online. Here you can learn about the historical roots of both festivals and how they have developed over the centuries. 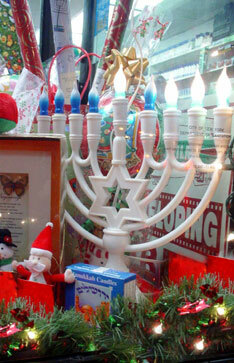 And questions are answered: Why are candles lit at Hanukkah? What does a Roman sun god have to do with Christmas? Why are potato pancakes eaten at Hanukkah? And what is behind the coined word "Chrismukkah"? Or you can play one of the games.